On the surface, Shovel Knight might resemble any one of the countless retro-inspired indy titles that have been released since Mega Man 9 made 8-bit graphics popular again. While most such NES-inspired indy games seem to completely fallback on nostalgia, Shovel Knight is a much wiser game. It doesn’t bother to hide its inspirations of Super Mario Bros. 3, Castlevania and, most prominently, Mega Man. But Shovel Knight understands that there were more to these games than 8-bit sprites and chiptunes. These games aren’t remembered for nostalgia alone, and they continue to endure because of the genius of their game designs. 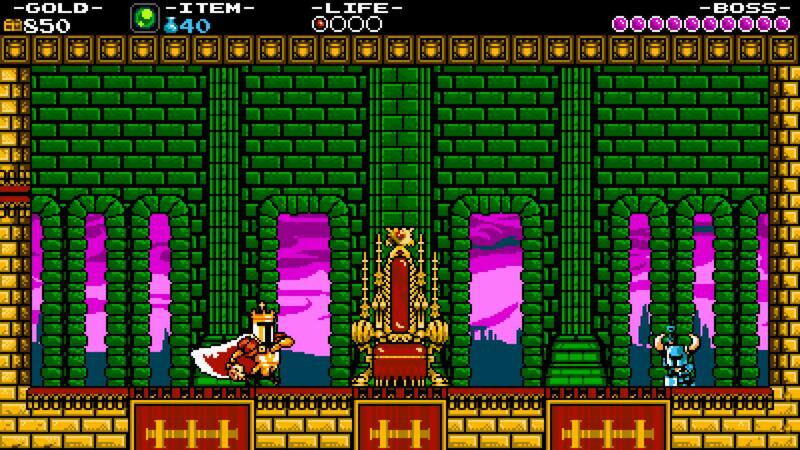 Shovel Knight seeks to replicate a similar genius, and while its inspirations are obvious, it does so in its own way. If you didn’t know any better, you’d be forgiven for thinking Shovel Knight was a NES classic from gaming’s earlier days. Shovel Knight works like many platformers from the 8-bit era, though its titular character has two primary means of attack: A simple strike with his mighty shovel or – pulling a page from Scrooge McDuck – a pogo stick-like jump. 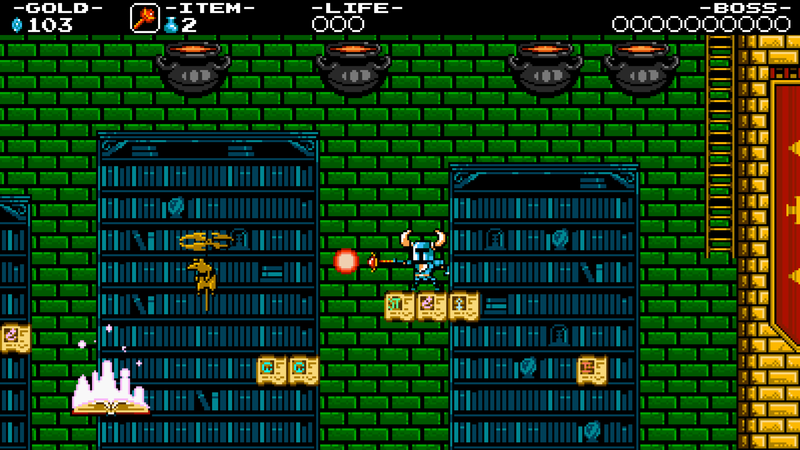 Shovel Knight also gains magic items throughout his adventure, akin to Castlevania, which grant him additional attacks or defensive actions. Naturally, wielding a shovel as a weapon also means that Shovel Knight can dig up dirt to find gold and gems, which he’ll need in order to buy upgrades to his armor, shovel, hit points, magic points and the aforementioned magic items. But be weary, because defeat means that Shovel Knight loses a chunk of his collected treasure. If Shovel Knight can return to the spot he fell he can reclaim it, but should he fall again before regaining his lost treasure, it’s gone. The game lacks a traditional ‘lives’ system, so game overs are never a concern even in the game’s most difficult moments, but losing your collected goods is a fun, modernized compensation for the traditional game over. The gameplay really is as simple as that. Run, jump, shovel, dig. But the game uses these simple mechanics to their fullest, and through some incredible and varied level design, it ends up being a deep gameplay experience. The stages are strewn together through a Super Mario Bros. 3 style world map, separated into four different segments. Shovel Knight allows players to select which order they want to tackle the levels in each segment, but every main stage in each must be completed before moving on to the next segment. The main stages are lengthy platforming romps that not only grow progressively more challenging, but also more creative. Each main stage is capped off with a boss fight against a different themed knight (all of which includes the title of “Knight” at the end of their name, in a nice tribute to Mega Man’s Robot Masters). Additional challenges, boss fights and optional stages can be found on the world map, should you want to go the extra mile for completion and treasure. Like many such indy games that build on old school blueprints, Shovel Knight is a challenging game. But whereas many of its peers feel the need to throw insurmountable obstacles at players right out the gate to prove their difficulty, Shovel Knight instead has a nice difficulty curve. It starts off with a simple introductory level to ease players into the game, and continuously becomes more difficult as the game goes on. This helps Shovel Knight’s difficulty feel more fair and, as a result, more fun than its contemporaries. Despite Shovel Knight’s challenge, it finds a brilliant means to cater to players of varying skill levels through its checkpoints. The levels all feature numerous checkpoints, so more easygoing players don’t have to fret about starting a stage over should they run into a particularly difficult section. But those wanting to test their abilities can destroy the checkpoints – gaining additional treasure in the process – to render them moot, meaning they’ll have to go through the whole stage all over again should they fall. It’s a simple but genius mechanic that adds an interesting twist on difficulty and balance. The game features an appropriately simplistic story, with Shovel Knight traveling to defeat the knights of the Order of No Quarter in order to unlock the Tower of Fate, hoping against all odds to defeat the evil Enchantress and rescue his (presumed dead) partner, Shield Knight. 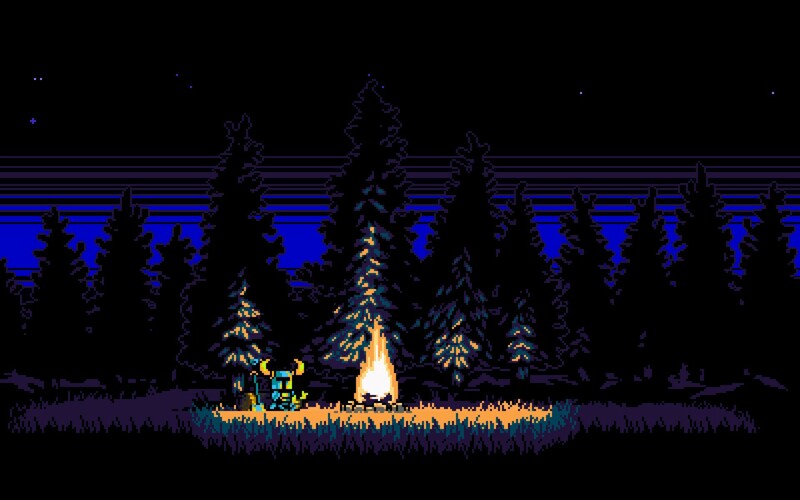 What’s interesting about Shovel Knight’s story is that, simple as it is, the game finds time to provide some quiet story moments to make Shovel Knight a more sympathetic character than most of his 8-bit kin. And despite what the game’s title and its hero’s weapon of choice might suggest, the game and its story never once feel tongue-in-cheek. It earnestly pays homage to retro games and their simplicity, never falling prey to cheap and easy parodies. 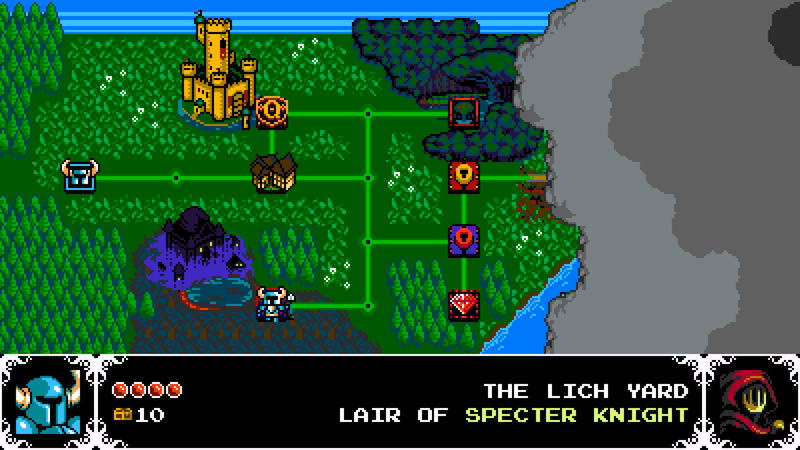 Naturally, Shovel Knight also includes a soundtrack reminiscent of the 8-bit classics that inspired it. Shovel Knight’s soundtrack is full of personality and energy, and can be compared favorably to many of the Mega Man soundtracks, which is no small feat. It also takes advantage of modern hardware by allowing more colorful visuals than the 8-bit games of yesteryear. It’s hard not to be wowed by everything Shovel Knight accomplishes. Its tight, polished gameplay is complimented by fantastic level design, a nice difficulty curve, fun visuals and stellar music. It not only draws its inspiration from Mega Man, Super Mario Bros. 3 and Castlevania, but it can sit comfortably alongside them in 8-bit glory. Great review. I’ve not heard anyone say anything negative about Shovel Knight yet. Love it! It’s hard to say anything negative about it. As you have mentioned, I love how the game blends old-school elements with modern gimmicks, like Shovel Knight’s development as a character – which you brilliantly pointed out; and checkpoints! My favorite aspect of the game is how the difficulty is customizable in a clever way. Sure, there are no lives, but the ability to break checkpoints if you feel like it can take the challenge to a whole new level that is much closer to what games of the 8-bit era tended to offer. Shovel Knight makes many small but impactful innovations that I think makes it feel more at home with 8-bit classics than a lot of the other retro-inspired indy games of today. I didn’t even noticed you could break the checkpoints for the first few levels, but then I broke one and got treasure, and then died and had to start back further. It hit me how cool of an innovation that was. That is indeed what makes Shovel Knight great; it invokes the style of 8-bit games while simultaneously creating its own identity in the process. The consequence-for-dying mechanic also seems reminiscent of Dark Souls, which is one of my favorite games from this decade. Though it’s not as difficult as Dark Souls, I still found Shovel Knight to be fairly challenging. All in all, it’s one of the best indie games I’ve ever played along with La-Mulana. I’m kind of glad Shovel Knight isn’t as difficult as Dark Souls. Dark Souls is great, but if too many games were that difficult it may get frustrating. But I definitely felt a Dark Souls inspirations in Shovel Knight. I haven’t played La-Mulana yet, but Shovel Knight is definitely one of the best indie titles I’ve played. I know I’ll come across like a villain for saying this, but I feel a lot of indie games are overhyped just because they’re indie. They have a tendency to just take a retro design, give it a visual makeover, add one gameplay schtick (rarely introducing more than that), and call it a day. They also have a tendency to feel either self-aggrandizing or way too tongue-in-cheek. I am obviously not saying every indie title falls prey to these things, but too many of the prominent ones have ended up disappointing me. Thankfully, Shovel Knight is not one of them. I know what you mean; now that games have shifted to more story-oriented experiences, it’s nice actually being able to finish them. I can’t imagine Planescape: Torment would have been as good if it was as difficult as Ninja Gaiden. It would be like getting to the end of a book only for it to end short of the conclusion and the author would only send you the last chapters if you could set a new world record. The way I see it, AAA games and indie games have their own set of pitfalls they often fall into. What you described is what I would consider the gamut of rookie mistakes indie developers make. Just to be fair, I’d say common mistakes that AAA developers tend to make (at least when it comes to writing) include not thinking through their implications or failing to make sure that the narrative and the gameplay aren’t telling contradictory stories. Funnily enough, the one mistake I’ve seen both AAA and indie developers make over the years is abandoning any notion of subtlety. I myself feel a slight aversion to certain critically-acclaimed indie games. I know a lot of them are experiences designed to make the audience feel as much emotion as possible. However, this typically translates to the emotional moments being surprisingly shallow because too many authors make the mistake of not developing them organically. Other indie games, as you say, rely too heavily on the creator’s one good idea, paradoxically turning it into a one-dimensional experience (for me, The Stanley Parable is the prime example of this). Shovel Knight succeeds because it eschews all of the clichés that indie games often find themselves plagued with. The creators simply decided to make a fun game, using the 8-bit, sidescrolling motif as a style guide, yet making into something that’s truly theirs.